Language Log » Enemy = Cousin? Naturally, I was somewhat suspicious of the validity of this; and a little looking in online Pashto-English dictionaries indeed failed to turn up any evidence for it. This seems to be fairly comprehensive dictionary, and it contains 8 words whose definitions include "enemy", none of which give "cousin" or anything similar as a meaning. The most common word for 'enemy' (judged by its presence in other dictionaries) seems to be duś̱ẖman (دښمن), glossed as "adversary, enemy, foe." This dictionary does appear to be from the 19th-century, so perhaps the usage has changed since then. Do you know if the statement is true? And if it isn't, do you have any idea where the author may have gotten the idea? But the same dictionary that Ali used (Henry George Raverty, A dictionary of the Puk'hto, Pus'hto, or language of the Afghāns, 1867) gives only the meaning "A father's brother's son, a cousin", for what must be the same word, turbūr. And the Pashto word for "enemy" that Ali cites is apparently still in use — thus Niloufer Qasim Mahdi, "Pukhtunwali: Ostacism and Honor Among the Pathan Hill Tribes", Ethology and Sociobiology 7: 295-304 (1986): "If a man seeking badal [revenge] is weak vis-a-vis his "dushman" (enemy), he will pass on his obligation to his sons, and they in turn to their sons." But I can't find any evidence that dushman is ever also used as a kinship term. The overwhelming majority of Afghans and Pakistanis cannot read and write, so showing them that the written turbur is a prefix and -ghanay a suffix, which , when combined create a compound word, fails to impress. So I tentatively conclude that the cousin/enemy meme is another of those linguistic confusions or exaggerations, like Eskimo snow vocabulary and Chinese crisis/opportunity, that are easy to start and hard to stop. Isabel Hilton, "Letter from Pakistan: Pashtun Code", New Yorker, 2001: Adam Nayyar, a fifty-two-year-old former nuclear chemical engineer, who abandoned his career when Pakistan began trying to build the bomb, in the mid-seventies, is now an ethnomusicologist and an expert on Pashtun culture. I spoke with him at his apartment in Islamabad. “Pashto is the only language I know in which the word for ‘cousin’ is the same as the word for ‘enemy,’ “ he said. Marcela Gaviria, "In search of Al Qaeda", Frontline (2002): And then there is what I read. 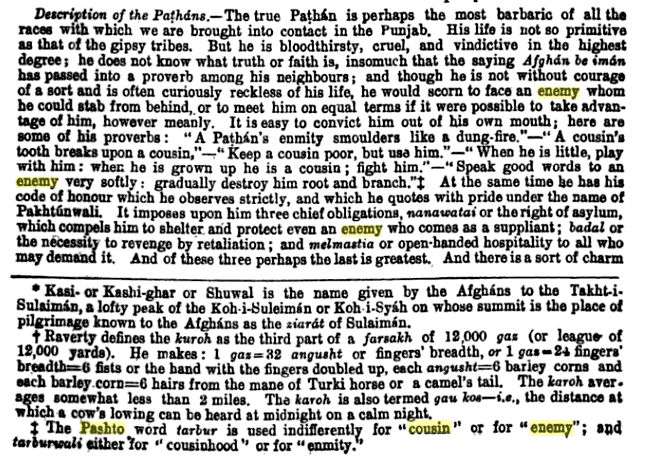 For instance, today I learn that in Pashto "cousin" is the same word as "enemy." "Pakistan Diaries: Darra bazaar": Sarah takes the time to read up on the Afridis and their language, Pashto, and explains that the Star Trek phrase, "Revenge is a dish best served cold" is actually an old Pashto saying. Apparently tribal people have gone as far as Los Angeles to avenge an inter-family quarrel with an honor-killing. Being related to another Afridi appears to offer no protection either, as cousins routinely quarrel over women and money with frightening regularity. Sarah continues to cheerily point out that in Pashto, the words for "cousin" and "enemy" are exactly the same. The cousin/enemy trope is useful because it highlights a stereotypical characteristic of segmentary lineage systems, which I have often heard illustrated by a proverb that goes something like "I against my brother; my brother and I against our cousin; my cousin and I against a stranger". From a Somali language consultant, I heard a version of this that broke things down into five or six concentric layers of potential inter-segment warfare; and I've heard similar sayings attributed to the Bedouin, to highland Scots — and to the Pashtun. "When God created the animals and humans he first created one ant and his spouse, then one buck and his goat, one ram and his sheep … finally one man and his wife, and from these ancestors sprang the tribes (qawm) of the ants, of the goats, of the sheep and finally the tribe of Adam. The offspring of the first ant became the grandfathers (nikagan) of the various tribes (qawm) and subtribes (qawm and khel) of ants …, as Adam's sons became the nikaganqawm), and their sons the nikagan of the tribes (qawm) within these peoples. One of Adam's sons or grandsons was Ibrahim, the nika of all nomads." There is a dilemma in tribal societies: the very tool which enables tribal leaders to establish powerful political entities, the charter of segmentary solidarity, is also instrumental for segmentary division. Once a charismatic leader who masters the instrument of segmentary alliance looses influence or dies the divisive character of the segmentary tribal system will gain the upper hand. Tribal systems do not usually develop institutionalised political power which could tolerate fluctuations in the abilities of individual rulers. The Pashtun ideal of equality is based on the tribal system. The idea is that all Pashtuns are born equal, and are children of one common ancestor; social and economic inequality, which of course exists, is not given by nature or birth but is achieved individually, and is threatened and open to change at any time. Whereas the tribal order discourages social hierarchy, it defines social nearness and distance. Pashtuns use their tribal order to mark lines of conflict and solidarity. If I see two men fighting I am supposed to side with the one who is “closer” to me, i.e. the one with whom I share the nearest common patrilineal ancestor. But the level of violence in Afghanistan is actually far lower than most Americans believe. In 2008 more than 2,000 Afghan civilians died at the hands of the Taliban or coalition forces; this is too many, but it is also less than a quarter of the deaths last year in Iraq, a country that is both more sparsely populated and often assumed to be easier to govern. (At the height of the violence in Iraq, 3,200 civilians were dying every month, making the country around twenty times more violent than Afghanistan is today.) Not only are Afghan civilians much safer under American occupation than Iraqis, they are also statistically less likely to be killed in the war than anyone living in the United States during the early 1990s, when the U.S. murder rate peaked at more than 24,000 killings a year. The most commonly practiced form of punishment, and the cornerstone of Pukhtunwali, is badal. The term is particularly applied to "revenge killing." Badal is an action taken to avenge death, or when the honor of a woman has been involved. When it is a matter to be resolved by badal, the right to avenge by death is the prerogative of the individual immediately concerned, but that right also resides in the family, section, clan, or tribe. Further, badal need not be restricted to action against the culprit, but can be taken against any member of his kinship group. Since the obligation of badal devolves upon a kinship group and the target of badal also can be any member of a kinship group, there is pressure on the individual by the group to refrain from letting a situation develop to a point at which it becomes a problem for the other members of the group. For the above-enumerated reasons, badal acts as a powerful curb on wanton killing. Given the Pathan trait of being quick to anger, the ubiquity of weapons and the facility with which they are resorted to in a quarrel, were it not for the principle of badal, tribal life would degenerate into a Hobbesian state of anarchy and war. It is thus interesting to compare Pukhtunwali to the Social Contract theory of Hobbes and Locke, English political theorists who regarded the state as the inevitable outcome of the desire to end a pre-state condition of anarchy and insecurity. Aslanov's 1985 Pushtu-russkii slovar' defines تربور tərbūr as "двоюродный брат (со стороны отца)" ['cousin (on the father's side)'] and gives the proverb "A cousin is a snake in one's bosom"; the derived word cited above as "turburghanay" is transliterated as trabgani (whose relationship to the basic word is less clear to the ear) and defined as 1) 'cousinhood'; 2) 'enmity, competition (usually between close relatives).' It seems clear that there is no synonymy in the linguistic sense, just a cultural sense that one's cousins can often be a problem. I'm surprised Mark let some of Peter Bergen's death rate comparisons slip by without mention. Notice first that he compares numbers of deaths, not death rates — according to Wikipedia and the US Census Bureau, the U.S. has more than 10 times the population of Afghanistan, so you would expect a higher number of murders even if the murder rate was the same in both countries. Also notice what numbers we're given for comparison. 2,000 Afghans killed by the Taliban and coalition forces in 2008, an arbitrary year, compared to over 24,000 Americans murdered (i.e., killed by other civilians) at a peak in the early 1990s, a decade and a half earlier. It's comparing bananas and lemons — yes, they're both fruits, but they don't mix well in a fruit salad. Someone with some extra time want find and to compare the 2008 murder rate in the US with the "more than 2,000 Afghan civilians [who] died at the hands of the Taliban or coalition forces" in 2008? The results might be the same — but at least the data will be more useful. [(myl) A basic comparison is not too hard. Given a 2008 Afghan population of 32,738,376 (Wikipedia's preposterously exact estimate), 2,000 deaths would be a rate of 6.1 per 100K; 3,000 deaths would be a rate of 9.2 per 100K. According to the FBI's crime statistics site, the overall U.S. murder rate in 2007 (the last year that I easily found) was 5.9 per 100K. For cities with a population over 250,000, it was 11.9 per 100K. For Detroit, it was 46 per 100K, and for Baltimore, 45. According to this page at the DOJ, the overall U.S. murder rate peaked in the early 1990s at about 9.8 per 100K. The next entry in Raverty, turbūr galwī, is glossed as "Nepotism, fondness for nephews, favoritism, or undue fondness for nephews, or other relatives. 2. Enmity to relations also, very common amongst the Afg̠ẖāns." I meant to add, that lemma sounds like "turburghanay". Particularly instructive and hilarious is the quote from the Ahmed and Hart piece, in which the learned outsiders pity the illiterate Pashtuns for not understanding the underlying etymological-psychological implications of the language that they (the Pashtuns) speak. People are determined to believe that language shapes thought even when the acutal speakers of said language don't recognize the things embedded in the language that are supposed to be shaping their thoughts. If I had to guess at the etymological relationship between turbur and turburghanay, I would imagine that it derives from the fact that feuds between cousins (which do occur — with my brother against my cousin and all that) are particularly nasty in the way that internecine squabbles tend to be. @Andy Hollandbeck — Even the comparison of Iraq and Afghanistan is wildly off-base — Iraq and Afghanistan are very close in population (31,234,000 in Iraq vs. 32,738,376 in Afghanistan) and Afghanistan is significantly larger (647,500 sq km vs. 438,317) so there's no way you can describe Iraq as "more sparsely populated," even discounting the fact that Iraq's population is much more urban. My own pocket Pashto dictionary (Pashto Dictionary and Phrasebook by Nicholas Awde and Asmatullah Sarwan, 2002) does not seem to include any reference to tərbur meaning "enemy"; the only word it has for "enemy" is dushman. For tərbur, my dictionary has two glosses: "cousin – father's brother's son" (as mentioned in some of the other comments above) and "distant cousin." Language Log readers will likely already know this, but dushman is also the word for enemy in Hindi & Urdu, and is not a kinship term. If I'm not mistaken, it comes from dusht (enmity) + man (mind). But it's obviously turburghanay that these writers are misinterpreting. Dushman is a Persian word. In Persian, I'd transliterate it, per the Unipers convention, as došman. I'm fully willing to believe that the vowel is in the first syllable is different in Pashtu. I have no idea whether the Pashtu word is borrowed from Persian, or whether they're simply cognates from a basic Iranian term. I expect the Hindi/Urdu usages are borrowed from Persian and/or Pashtu. There's no Persian cognate of tarbur, that I know of. The words for cousin in modern Persian contain references to the words for uncle (they both translate literally as uncle's son, or uncle's daughter) and both words for uncle are borrowed from Arabic. Perhaps there are Iranian words for cousin used in quasi-archaic poetic vocabularies, or still in living use in central asian dialects of Persian, but I don't know any such words. A corollary to the argument that Afghanistan is unconquerable is the argument that it is ungovernable—that the country has never been a functioning nation-state, and that its people, mired in a culture of violence not amenable to Western fixes, have no interest in helping to build a more open and peaceful society. Leaving aside the rather dubious statements or assumptions about the current culture in Afghanistan (and whether or not being a "functioning nation-state" is that desirable a condition at all; it had kind of a mixed track record in the 20th century), I would have thought it's obvious that culture is one of the things that might change in order to "build a more open and peaceful society". "Is there a name for the belief that the culture a given (other) group of people currently has is the only one they will ever have, or even the only one they *could* ever have? " "the word for the worst kind of hatred is turburghanay which could be literally translated 'cousin-hatred'"
This actually makes sense to me, especially in the context of a culture which puts great emphasis on family bonds (i.e., in which family is extremely important). It seems logical that in such a society hating a family member would be the worst kind of hatred (as opposed to hating an enemy, which would be normal behavior) and would imply something really bad must have happened for it to develop making it also "the worst kind" in the sense "most powerful" (as opposed to "least desired"). Off topic: dushman also made its way to Serbian (via Turkish) as dušman (Cyrillic: душман) where it is stronger than the default word for enemy, namely, neprijatelj (непријатељ) which is simply neg. prefix + friend. For Hobbes, Locke, et al, overall social order is only arrived at by design, whereas in Pukhtunwali it may be an emergent property of a web of innumerable individual and small-group relationships. Anybody know who these "UK intellectuals" are, and whether they were likely to be channeling old Pashto sayings? It doesn't seem completely implausible, because some of the Brits got to Afghanistan and back. Somebody had to have said it first; to equate food preparation with revenge seems not very natural. I think it's been more common to connect revenge with drink, actually, as in Hamlet. I suppose a cold drink wouldn't work: "Revenge is a wine best served cold" seems not to capture the essence of the matter. @Jim: I'm sure you're right. "Essentialism" must be the word Chris is looking for. But I wish it weren't. There is a perfectly respectable philosophical school by that name, and philosophers who adhere to that school are really no more likely than anyone else to jump to the conclusion that a set of socially ascribed characteristics are immutable. Rather the contrary, in my experience. The Essentialists I've known tend to be extremely reluctant to identify any characteristic as essential. I suppose that's because they have professional reputations to protect. "In 2008 more than 2,000 Afghan civilians died at the hands of the Taliban or coalition forces; this is too many, but it is also less than a quarter of the deaths last year in Iraq, a country that is both more sparsely populated and often assumed to be easier to govern." Is that statement about relative population density accurate? When I read it, it sounded like a mistake. According to Wikipedia, Iraq has 66 people per sq. km, and Afghanistan has 46 people per sq. km. So Aghanistan appears to be the more sparsely populated country. This doesn't seem to be simple confusion between "densely" and "sparsely," though, since you would indeed expect fewer war deaths in a more sparsely populated country. Just a simple factual error? It would be fair to say that Iraq and Afghanistan are comparably densely populated. The difference isn't enough to make a distinction, considering differences in terrain and proportions of habitable and usefully arable land. I also thought of "cousin" and "cozen". We also have "feud" whose original meaning is "faith" or "loyalty". "Defiance" oringinally meant the explicit breaking of a bond of loyalty, something you can only do within a social system. Likewise "rival" was originally someone you shared a river bank with. I think what these all boil down to is a sense of order: there are people you have conflicts with, bloody or otherwise, within an established framework. And that means that you can potentially achieve peace, cooperation, trade, or at least a state of grudging coexistance. That seems to me a step up from a society where the enemy is always a stranger or an alien being of unfathomable motives. I have my doubts about that: Google Books finds no references to it in the late 1890s slot claimed by the HK Standard article cited by Wikipedia. Earliest reference I can find is 1957, even including possible Italian variants like "La vendetta è un piatto che si serve freddo" (as it's commonly claimed to be a Sicilian saying). Revenge is not good in cold blood. [Bismarck] had defended Olmütz, it is true, but . . . with a secret resolution to 'eat the dish of his revenge cold instead of hot'. Simon Cauchi: the first quotation is from Shelton's translation of Don Quixote (1620): Revenge is not good in cold blood. How, Sir, says Adams, do you take me for a Villain, who would prosecute Revenge in cold Blood, and use unjustifiable Means to obtain it? The innovation, whoever and whenever it came from, is to see delayed and carefully-plotted revenge as laudably clever rather than deviously villainous. The use of 'cousin' to mean 'enemy' may be an ironic or euphemistic usage, and may be limited to the speech of tribal warriors, the way 'godfather' is used to mean 'crime boss' or 'patron' to mean 'customer' in English. The fact that this usage does not appear in Pashto dictionaries may mean only that these dictionaries are based on the standard Pashto of Afghanistan and that their compilers have not been influenced by the descriptivism that informs English-language dictionaries. Interesting how people have been trying to explain the possible association between "cousin" and "enemy." I thought I might point out (FWIW) that the main plot of the Mahabharata (see http://en.wikipedia.org/wiki/Mah%C4%81bh%C4%81rata) is, in fact, animosity between cousins.
. . . no se ejecutan bien las venganzas a sangre helada. The fact that this usage does not appear in Pashto dictionaries may mean only that these dictionaries are based on the standard Pashto of Afghanistan and that their compilers have not been influenced by the descriptivism that informs English-language dictionaries. Huh? In the first place, the usage does appear (see my comment above); in the second, of course foreign-language dictionaries practice "descriptivism" — a dictionary that only included usage that met with the approval of high-status cultural arbiters and ignored the way the language was actually spoken wouldn't sell (or, in the case of my Pashto-Russian dictionary, be useful to occupiers/"fraternal allies"). Thank you all. Ray Girvan seems to find the earliest cite in Doyle 1877. I suppose Lowe 1885 could have been quoting Doyle. The earlier references mention plaintiff's blood, cold or hot, not identifying it with the revenge. It seems unlikely that Sicilians would have got it from Doyle. (Why does Hamlet call his uncle a Dane? And, does expecting them to end up in th' same place mean he blames her too? But I digress.) Where did the myth that it was in Les Liaisons dangereuses arise? In the Sicilian and Pashto forms, who eats, the aggrieved or the offending party? Everyone knows that revenge is a dish best served breaded and baked in a white wine sauce with shallots, mushrooms, and capers. I'd always assumed that "revenge is a dish best served cold" means that the revenging party savors the act rather than just gulping it down. This idea is often expressed in action movies as the reason for the villain putting the hero in the slow death mechanism– albeit it doesn't explain leaving the hero alone so they can escape. Hmmm. For years, I've been under the impression that revenge is a dish best served with pinto beans and muffins.
' Revenge must be eaten cold ; ' he who wants to eat it hot, will burn his tongue. "Unpublished letters of Benjamin Franklin", The Century Illustrated Mothly Magazine, May-October 1886. Hamlet calls his uncle the Dane (thou Dane is a definite reference, not an indefinite one) because he is the king, just as Gustavus Adolphus was the Swede to his friends and enemies during the Thirty Years War, and the Sultan of Turkey (whoever he might be at a given time) was the Turk to the whole of Europe. And I think he means "follow my mother into death", not necessarily to the same destination beyond death, though he may well blame her in part, as his first scene with her indeed suggests. As Cameron says, Hindu/Urdu duśman is a borrowing from Persian. However, both components have (fairly transparent) native Indo-Aryan cognates, so it was probably analysable when it was borrowed: man is an (inherited) Hindi word meaning "heart, mind", and dur-/dus-/duṣ-/duḥ- (cognate with Persian duś-) is a Sanskrit morpheme used in Hindi, e.g. duṣkarm "evil act, sin", duḥkh "sorrow", durgandh "bad smell", durjan "villian", etc. Benjamin Franklin (1786) is a very good citation indeed, unless it implies, instead, a forged letter. It seems pretty definitive, now, that revenge is rather to be savored by the aggrieved than choked down by the offender. I wonder, still, how it got associated with Valmont. Maybe it appears in a (too-free) translation? I doubt Ben Franklin or his associates had much contact with Pashtuns, but it hardly seems inconceivable that he encountered Sicilians on one or more occasions. [(myl) I doubt that the letter was forged; but the titles to the letters were pretty clearly added by the editor (John Bigelow), and not written by Franklin. Thus the first letter in the collection, which is dated June 17, 1772, is given the title "Cooperative association as practiced a century ago". But it's a description of homes for the elderly in Holland, taken from a book contemporary with Franklin. This implies that the title is written from the perspective of the editor in 1886, not Franklin in 1772. Also, from the facsimiles that I've seen, Franklin was not in the habit of putting titles on his letters, any more than others did then or do now. Here is the link for the Franklin citation. US access is needed to read it in full (I had to use a proxy server). There is a problem, though: who added the title? Franklin or the collator of the letters? Actually this sets the Pashtun system apart from other segmentary systems like the Bedu or Somalis. The reason is that the hostile cousins link up with other hostile cousins who are more distantly related, developing into a factional system that cuts across segmentary lines. For more info, see Barth's Political Leadership among the Swat Pathans, Akbar Ahmed's books, Charles Lindholm's Generosity and Jealousy, and basically all other anthropological writings on the topic of male Pashtuns. Most famously, the White and Black Factions of eastern Afghanistan were very important in past conflicts (although they are now defunct identities, people still know whose side they were on). So that Arab saying you quote ("my brother, my cousin, etc.") doesn't apply to Pashtuns. Which is what Peter Bergen was saying. Has anyone (including Mark) ever talked to a Pashtun about this topic? Because tarbur most certainly still does still carry a taboo connotation in Pashto (cf. the above references to cousin/cozen and feud/faith, also classic taboo words)–one would never call his own cousin a tarbur because it is insulting and potential feud-starting. This is confirmed by my Pashto teacher, who has no reason to lie to me or romanticize Pashtun culture–she very matter-of-factly told me, without prompting by me or anthro writings, that male first cousins very frequently dislike each other intensely. The orphan; or, Memoirs of Matilda, tr. [from Mathilde] by the hon. D.G. Osborne by Marie Joseph Eugène Sue (1846): "And then revenge is very good eaten cold, as the vulgar say"
The Buccaneer Chief, by Gustave Aimard‎, by Olivier Gloux (1864): "He was young, and could wait ; vengeance is eaten cold, say the southerners — and the Count came from Languedoc." Apparently Aimard was Olivier Gloux's pen name. The edition scanned bears the stamp of the Bibliotheca Bodleiana, which suggests a more catholic taste than I had suspected. Et puis la vengeance se mange très-bien froide, comme on dit vulgairement. The words "se mange très-bien froide" are italicized, indicating (presumably) quotation of a proverbial saying. The earliest identified European use, then, is in French in 1841, there implied to be in common usage. It seems somehow doubtful that the French populace adopted it directly from Pashto, or via unpublished English couriers. Google books doesn't seem to turn up anything at all in Italian, Spanish or German. For those debating Etymology, /dušman/ is Old Persian in origin, from the Avestan /dušmainyu/ "think badly," which can be broken up into /duš, duj/ "bad" (Prot-IE /dus/) and /mainyu/ "thought/mind" (Proto-IE /mn-yo/). As mentioned, this is etymology is echoed in Sanskrit and the word /dušman/ seems to have a lot of legs, appearing in Persian, Pashto, Hindi/Urdu, Turkish, Azeri, Serbian, and others I'm sure. As for /turbūr/, it is likely related to the Sanskrit /pitṛvyḥ/. पितृव्यः 1 A father's brother, paternal uncle. -2 Any elderly male relation; Ms.2.13. -Comp. -पुत्रः a father's brother's son, cousin. Always intriguing to me the important nuances between languages.It seems there is never a straight translation, but we always are able to get our sentiment across one way or another. "Whilst he is little, play with him; when grown up, he is a cousin so fight with him."